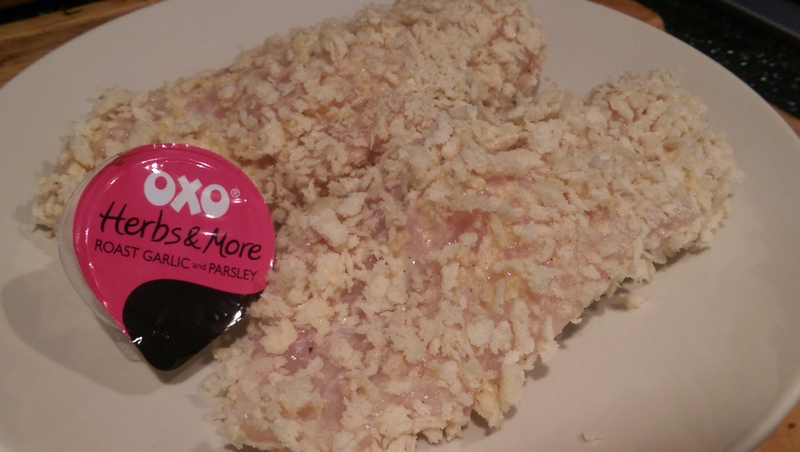 Last week I was asked to take part in the 'OXO Recommended by Foodies' product trial, run in association with the Immediate Insiders Panel and BBC Good Food. OXO were looking for feedback on their newly launched 'Herbs & More' flavour pots so sent me a pack of the Roast Garlic and Parsley flavour pots as well as a few quick and easy recipes to try out in my own kitchen. I had no firm plans in place for last Thursday night's dinner so decided to prepare the Cheat's Chicken Kiev using the flavour pot. I prepared the chicken in the same way that I would have if preparing my Katsu Curry but the recipe below is perhaps a little easier and uses less crockery! Heat oven to 200C/180C fan/Gas 6. Mix together the Roast Garlic and Parsley Herbs & More flavour pot with the soft cheese. Tip the breadcrumbs onto a plate and set to one side. Cut a slit (roughly thumb-length) in the side of each chicken breast at the plump end. Spoon 1/4 of the soft cheese mixture into each hole and press the edges together to seal. 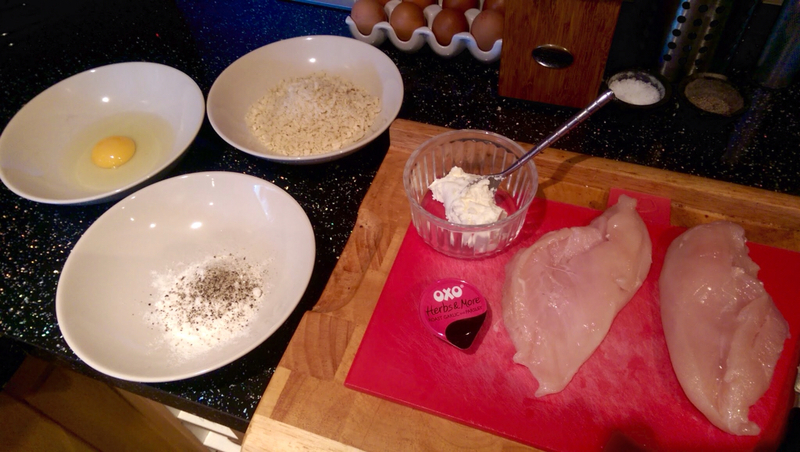 Rub the oil over the chicken breast before pressing the breadcrumbs onto them. Place the coated chicken in a shallow roasting tin. 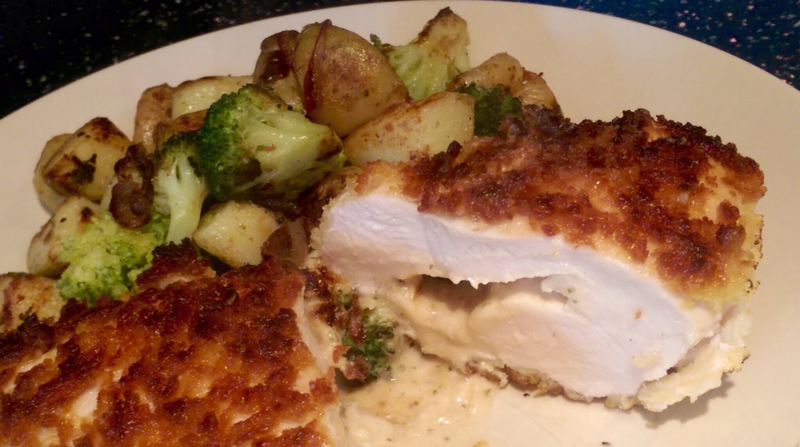 Bake for 20-25 minutes until the chicken is cooked and the crumbs crisp and golden. The end result of the Cheat's Chicken Kiev recipe was fantastic. It's lucky that myself and Nicola are big fans of garlic because the pots are packed full of flavour and it wasn't long before the kitchen was being taken over by the aroma of smoky roast garlic. Like a lot of these 'flavour pots' that are on the supermarket shelves, the pots were very salty however as we both love salt, it didn't bother us although I think that some people might take issue with the heavy saltiness. That said, there is no mistaking that roasted garlic is the dominant taste and it delivers a huge natural roast garlic flavour. The pots come in a wide range of flavours so if you're looking to add a quick burst of flavour to up your dinner, you won't go wrong in adding OXO Herbs & More to your next shopping list. Don't worry if you're struggling to think how you would use them, you can check out the website for a list of easy recipes.